Today, Bantam Live, is launching the commercial version of its social CRM workspace and is rolling out premium features of its product. Bantam Live provides an online workspace for business teams that has “social CRM” features, which include a real-time dashboard stream of messaging and workflow activity along with a native CRM application. Members can share information, track activity, and manage contact and company relationships both inside and outside the organization via a real-time activity stream. We last wrote about Bantam when the startup debuted its product at TechCrunch’s RealTime Stream CrunchUp last July. Bantam extends a company’s sales outreach and customer relationships out to the social Web. For instance, with Bantam, a user can search Twitter, import a new contact with one click, initiate task workflows with team members to engage this new contact, and then converse with the new contact for lead generation. All of this happens within the same application, integrated with Twitter and soon other social networks like Facebook. Bantam Live also allows users to search, monitor, and connect with people across the web for sales leads, business development, and marketing purposes. Members also can manage their calendars, file sharing and task management within the platform. Similar to the activity stream on Facebook, Bantam Live will now include co-worker notiﬁcations, workflow information, customer communications and other messages within a realtime stream in a dashboard. Bantam Live also recently raised a second round of funding from angel investors, bringing the startup’s funding to $1.7 million. 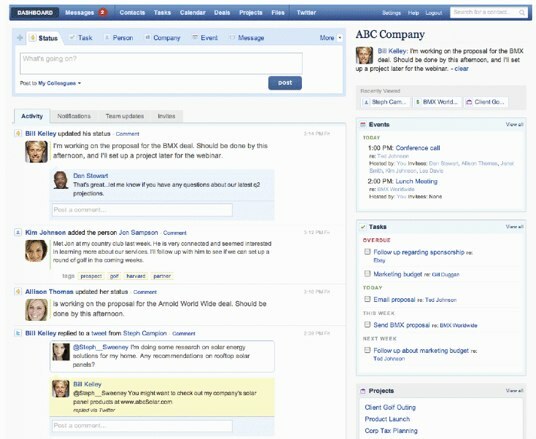 Of course, Bantam will face competition from Salesforce’s upcoming product in the social CRM space, Chatter. But Bantam’s CEO John Rourke maintains that his offering is not only comprehensive, but also more reasonably priced than Chatter. Plus, Bantam is entering the marketplace now, ahead of Chatter. That being said, Bantam is still entering a crowded space that includes many worthy competitors besides Chatter, including Jive, Cubetree and Socialtext. Bantam Live charges a monthly subscription fee for a range of plans that range from $19 (for a Personal plan) up to $140 per month large groups/heavy use. We have a special offer for TechCrunch readers in the month of February; enter the promocode “TECHCRUNCH” when signing up for Bantam, and you will save 50% on your ﬁrst two paid-months, after a free 30-day trial.